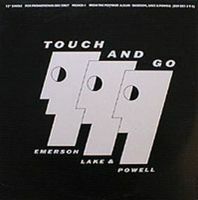 Of all the singles being released by prog rock bands in the 1980s, Emerson Lake & Powell's Touch and Go has got to be one of the better ones. If a prog rock band had to make a single and keep it under four minutes, they would likely have to extract it from a bigger piece (almost always a disaster), or put together something like this. Upon initial listens, the obvious feature of Touch and Go that hits you squarely in the head is the dramatic, overpowering keyboard work of Emerson. It invokes words like glorious, military parades, and royalty all in one. And it's fitting with the "running with the devil" line that is repeated often. The drum work is delivered in military precision, with slow, prodding drum rolls. Lake's vocals are soaring, strong, and powerful. Indeed, in my youth, it was the radio play of this song that caught my attention to buy the album and lead me into their more productive releases of the early 1970s. The B-side is the fast moving Learning to Fly. It's more in the realm of AOR meets prog, but is one of the better songs of the ELPowell album. One of the better singles from a prog band (of which very few actually released warrant such a comment). Understandably this single is still an item that is more of a collectible if you already have the ELPowell album, or for the completionist. Musically Touch and Go is a four-star number. The B-side is about two stars, averaging this release at three.